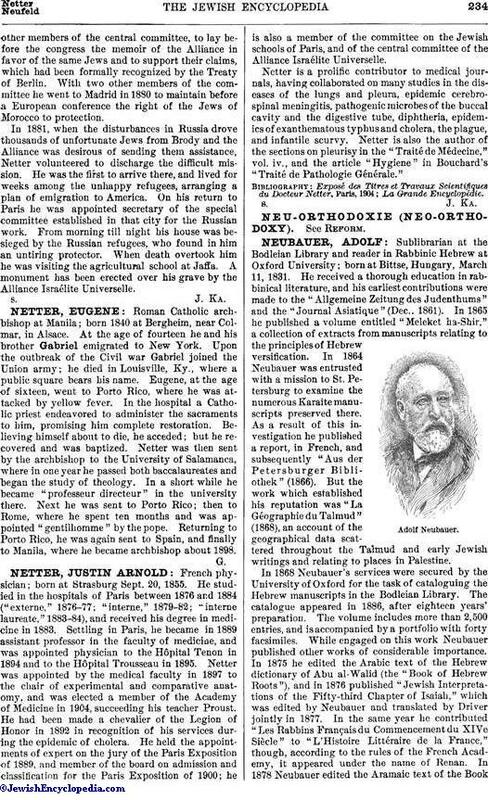 Sublibrarian at the Bodleian Library and reader in Rabbinic Hebrew at Oxford University; born at Bittse, Hungary, March 11, 1831. 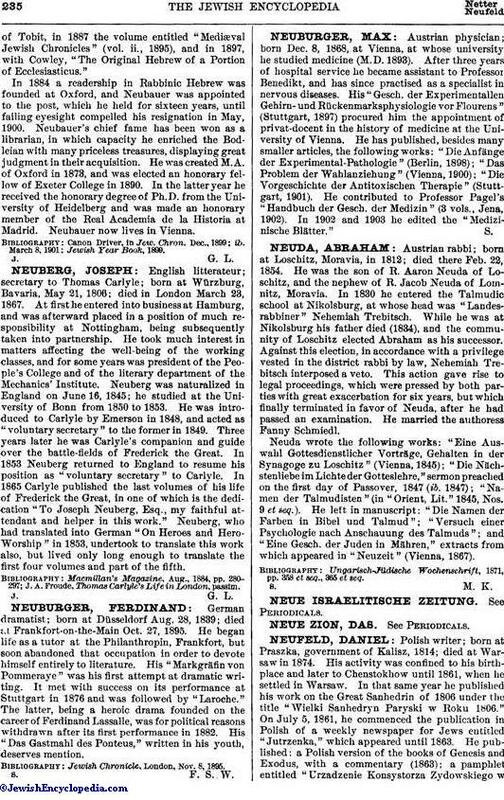 He received a thorough education in rabbinical literature, and his earliest contributions were made to the "Allgemeine Zeitung des Judenthums" and the "Journal Asiatique" (Dec., 1861). In 1865 he published a volume entitled "Meleket ha-Shir," a collection of extracts from manuscripts relating to the principles of Hebrew versification. In 1864 Neubauer was entrusted with a mission to St. Petersburg to examine the numerous Karaite manuscripts preserved there. As a result of this investigation he published a report, in French, and subsequently "Aus der Petersburger Bibliothek" (1866). But the work which established his reputation was "La Géographie du Talmud" (1868), an account of the geographical data scattered throughout the Talmud and early Jewish writings and relating to places in Palestine. In 1868 Neubauer's services were secured by the University of Oxford for the task of cataloguing the Hebrew manuscripts in the Bodleian Library. The catalogue appeared in 1886, after eighteen years' preparation. The volume includes more than 2,500 entries, and is accompanied by a portfolio with forty facsimiles. While engaged on this work Neubauer published other works of considerable importance. In 1875 he edited the Arabic text of the Hebrew dictionary of Abu al-Walid (the "Book of Hebrew Roots"), and in 1876 published "Jewish Interpretations of the Fifty-third Chapter of Isaiah," which was edited by Neubauer and translated by Driver jointly in 1877. In the same year he contributed "Les Rabbins Français du Commencement du XIVe Siècle" to "L'Histoire Littéraire de la France," though, according to the rules of the French Academy, it appeared under the name of Renan. In 1878 Neubauer edited the Aramaic text of the Bookof Tobit, in 1887 the volume entitled "Mediæval Jewish Chronicles" (vol. ii., 1895), and in 1897, with Cowley, "The Original Hebrew of a Portion of Ecclesiasticus." In 1884 a readership in Rabbinic Hebrew was founded at Oxford, and Neubauer was appointed to the post, which he held for sixteen years, until failing eyesight compelled his resignation in May, 1900. Neubauer's chief fame has been won as a librarian, in which capacity he enriched the Bodleian with many priceless treasures, displaying great judgment in their acquisition. He was created M.A. of Oxford in 1873, and was elected an honorary fellow of Exeter College in 1890. In the latter year he received the honorary degree of Ph.D. from the University of Heidelberg and was made an honorary member of the Real Academia de la Historia at Madrid. Neubauer now lives in Vienna.